For the past week or so, I've been working on Girasole by Jared Flood. It's been a very enjoyable knitting experience so far. The way the pattern is composed of several different sections, instead of getting tired of repeating the same pattern over and over again, you complete one and then move on to a different one. It breaks the large project into bite-size bits, and makes it less over-whelming. On a vacation in Lapland this week I'm determined to finish it in the next couple of days. Finally a successfully finished project! I was so determined to avoid the second mitten syndrome, that I cast on for the second one immediately after the first one was finished, and more than just enjoying the knitting I just wanted to get them finished. Now I have regained my faith in my knitting. This is a free pattern called Smockies , and the main reason I wanted to make them was the beads and the way they were used to create a surface pattern. This is actually the first time I've used beads on a completed project. Another reason I wanted to knit this pattern was that it was finally a good reason to use some of the DROPS Alpaca I have that I've acquired in several different colors but, again, never used on a finished item. The needles I used were bamboo DPNs in size 2.5 mm. The modifications I made were changing the ribbing on the cuff to 2 x 2 instead of 1 x 1, because with my relatively loose tension and drapy alpaca yarn the ribbing just wasn't springy enough. I also made the section after the thumb hole 5 cm instead of 6 cm long, and the thumb is also slightly shorter than suggested. Taking decent pictures in the daylight we have this time of year late in the afternoon was a challenge. In the past few days, I feel I've been hit with a knitter's block: I've started three different projects, all of which ended up being ripped because I didn't like the way they turned out. Now I'm afraid of starting yet another project, thinking that yet another failure is going to kill my desire to knit anything for a long time. To channel my frustrated energy on something, I went through and re-organized all my yarn, needles and other knitting supplies last night. I was slightly embarrassed to realize how much yarn I have, considering I've been buying some more just this past week, too. It's definitely time for a yarn diet. I have absolutely no excuse to buy any more until I've made a signifigant dent to my current stash. Some of it I will probably give to my sister who seems to have been bitten by the knitting bug recently. I also found some needles that I didn't know I had. A couple of times recently I would have needed 5 mm DPNs, only to be surprised not to find any in my drawer. Well, they were there, just mixed in with about a hundred yarn labels I've been collecting for some unknown reason. The idea of a shawl that stays on while moving around and the simple design were the main reasons I decided to try out my first pattern, the Butterfly Moebius, from The Knitter's Book of Yarn by Clara Parkes. I also wanted use some of my Felted Tweed by Rowan, which is a beautiful and lightweight yarn, even if somewhat fragile (I broke it once when pulling the center of the ball out). The yarn certainly seems to be suitable for shawl type projects. The needles I used were 4.5 mm. I'm quite happy with how it turned out, but it's slightly too large for me, as it keeps falling off my shoulders. This may end up being gifted to someone else instead. 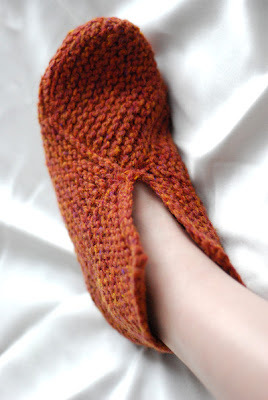 I wanted comfy slippers to wear around the apartment and, inspired by a pair of slippers made by Mustaa villaa, I found a pattern for slippers made out of eight squares each. I have to say the knitting experience wasn't the most fun I've had, since I didn't particularly enjoy casting on and off for a total of sixteen squares, and then sewing them together like putting together a 3D puzzle. But I'm quite happy with how they turn out, they certainly fulfill the job of comfy home slippers. They are made out of Rowan Scottish Tweed Aran on 4.5 mm needles, with a crocheted edge. There is something about this yarn that I'm not completely in love with, although I do like the tweedy colors a lot. Blocking made it softer, but I'm still not convinced I like it in general. Welcome to my new knitting blog! I used to have a blog before, but when my web host lost it several months ago, I've been too angry and frustrated to think of starting from scratch until now. Since I had already started getting sick of using Wordpress with the old blog, I thought this time I'll use something low maintenance which won't keep me from posting just because it's too awkward to use. 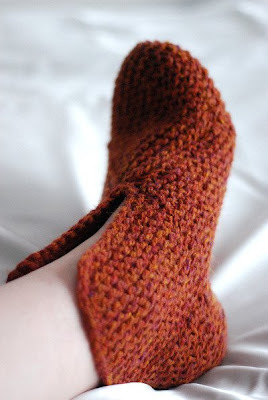 Therefore, I chose blogger, which seems to be a popular choice among knitting bloggers. Hopefully this choice will have a more productive outcome. The first project to be posted here is going to be Fiddlehead Mittens by Adrian Bizilia that I made for my sister Susanna. They were easier than I'd expected, with the repeating and symmetrical pattern being relatively fast to knit. The hardest part for me was the i-cord cast on, which I'd never done before. Even though I used 2.5 mm needles, they turned out almost too large, especially the second mitten which I seem to have knit with a fairly loose tension when I tried to avoid making the stranded pattern too cramped (my stranded knitting technique could use some improvements). 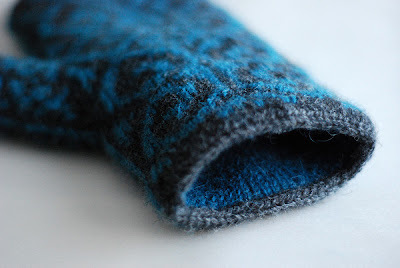 For the outer mitten I used one of my favorite 100% wool yarns, Paksu pirkkalanka, which is produced by a local company. 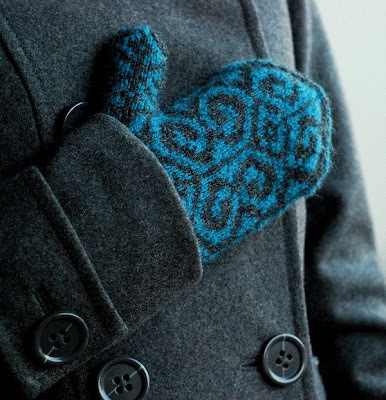 It's great for stranded knitting and I've used it on mittens before. For the lining, I used Alpakka by SandnesGarn, again one of my favorite yarns, which is very soft, and enjoyable to knit. I'm quite happy with the result. The colors are quite toned down. I tried to choose colors my sister would like, but for my second go at this pattern I'm going use a totally different color palette, and something I will enjoy wearing (I'm thinking maybe orange combined with lighter gray, possibly with some green or red).